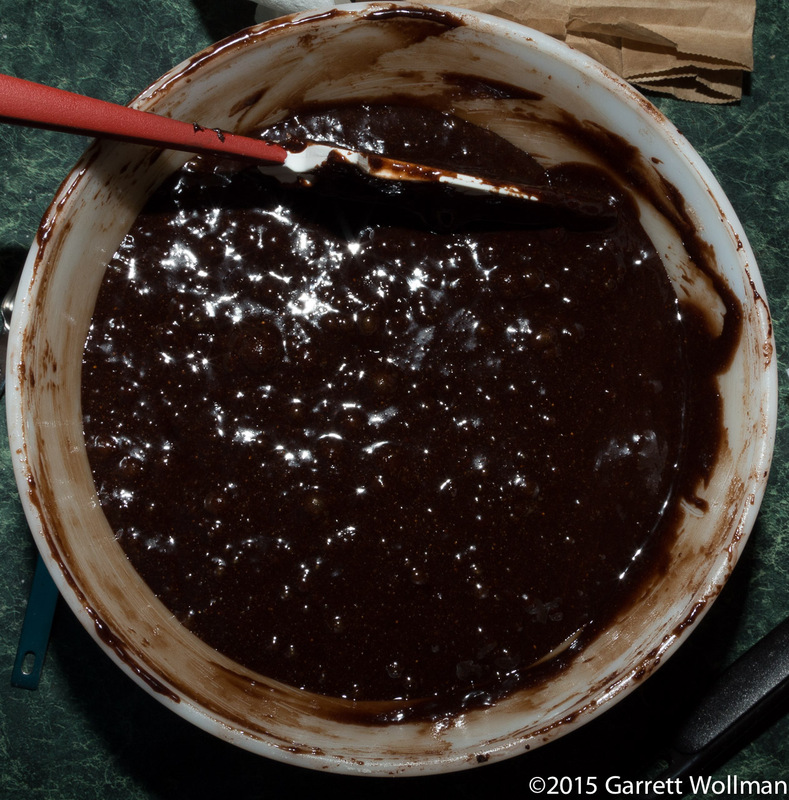 This weekend, I’m continuing my exploration of King Arthur Flour’s 2006 cookbook Whole Grain Baking (Countryman Press) with a brownie recipe that all traditional (hard red) whole-wheat flour. “Double Fudge Brownies” (p. 341) have two forms of chocolate — both Dutch-process cocoa and chocolate chips — and are sweetened entirely with brown sugar, which accentuates the dark, bitter notes of the chocolate in a lovely way. Using Dutch-process (alkalized) cocoa not only gives a deeper brown color to the “brown”ies, it also obviates the need for additional baking soda to neutralize the acidity of natural cocoa. Like many chocolate baked goods, the recipe also calls for espresso powder (although it’s entirely optional), which also enhances the color and provides additional bitter flavors. After both tasting and computing the nutrition, this is probably my new favorite brownie recipe: the combination of great chocolate flavor, a texture that is neither too fudgy nor too chewy, and a relatively low calorie count (under 400 kcal for a fairly large serving) make it a major winner in my book. We start, as usual, with the mise en place. 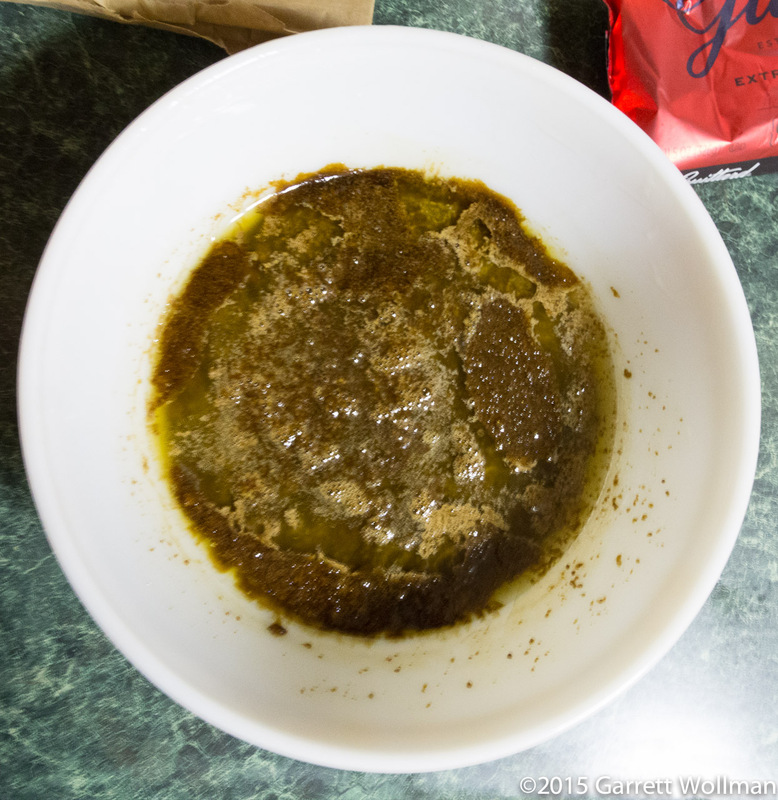 If you’re a regular reader, you’re probably already trying to guess which important ingredient I left out. If you guessed “eggs”, you’re correct! Note that I made three substitutions, two of which are significant: I used Nielsen-Massey vanilla paste in place of the extract (and not enough of it — the recipe calls for a tablespoon but I misread it and only put in a teaspoon); in place of regular “light or dark” brown sugar I used India Tree dark Muscovado sugar (that’s the brown substance in the stainless-steel bowl); and rather than generic semisweet chocolate chips (think Nestlé Toll House morsels) I used Guittard 63% dark chocolate baking chips. 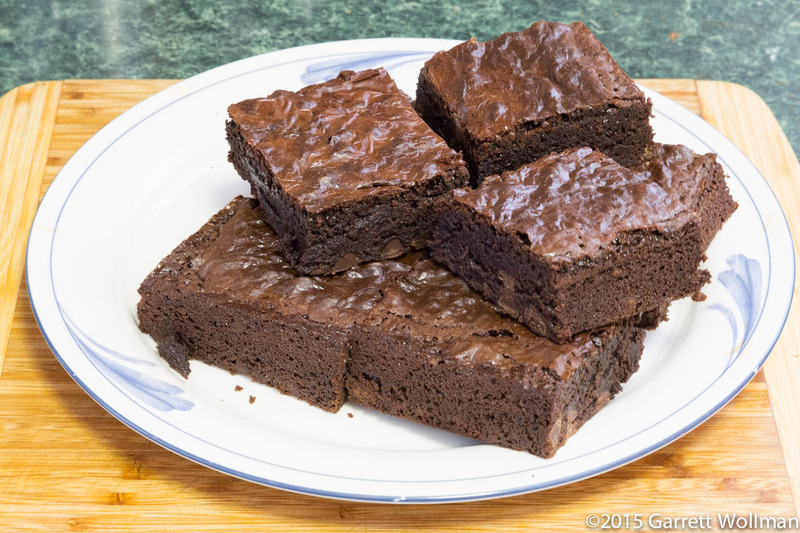 The latter two substitutions have the effect of deepening and strengthening the flavor, making these brownies rather more adult than your typical supermarket boxed mix (and far more so than your typical flavorless supermarket-bakery brownie). Four eggs have now been added, one at a time, and then the whole-wheat flour and the chocolate chips, to form the finished batter. 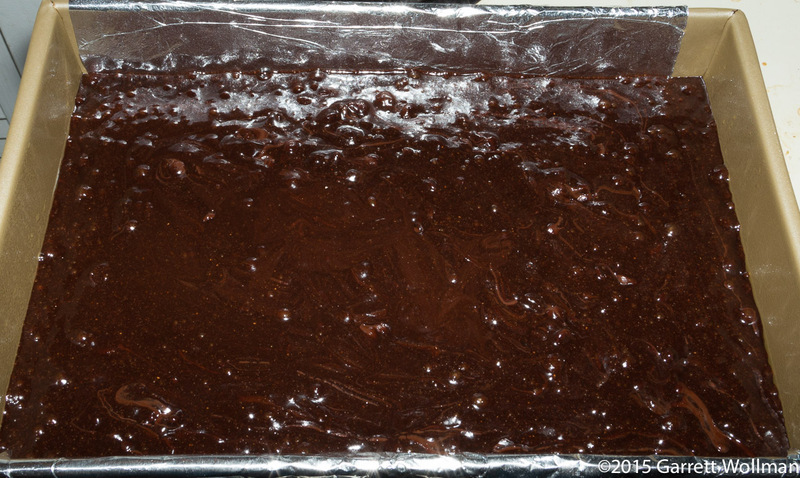 I prepared the 9x13x2 baking pan with baking spray, but then added an aluminum-foil “sling” to make it easier to remove the finished brownies after baking. This is especially useful in this case because the recipe calls for letting the brownies cool, uncut, in the pan overnight, to allow the wheat bran to soften — but this also gives the brownies even more opportunity to stick to even the best baking pan. After letting them rest overnight, I used the foil sling to depan the uncut bar (OK, I couldn’t resist taking a tiny corner while they were still warm!) and prepare for portioning. 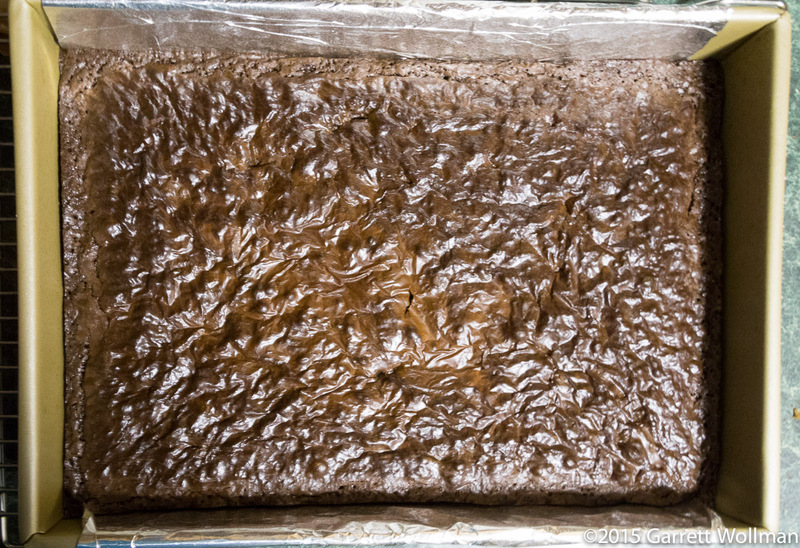 The brownies really stuck to the foil, even though I had greased it, making me think that next time I should use parchment rather than aluminum foil for this recipe; I ended up having to use a spatula to remove them. (I suppose I could have inverted the bar and peeled the foil off that way, but I was afraid that it might pull chunks out of the bottom, which is never a good thing.) I used a ruler and my bread slicer to mark the top of the bar for 15 individual portions, then used a bench scraper to cut straight down through the bar to actually slice the brownies. 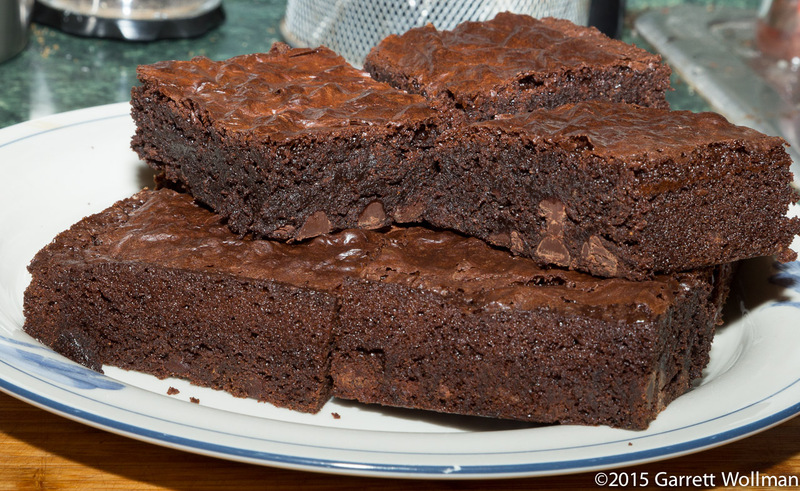 A plate full of brownies is a lovely thing indeed. 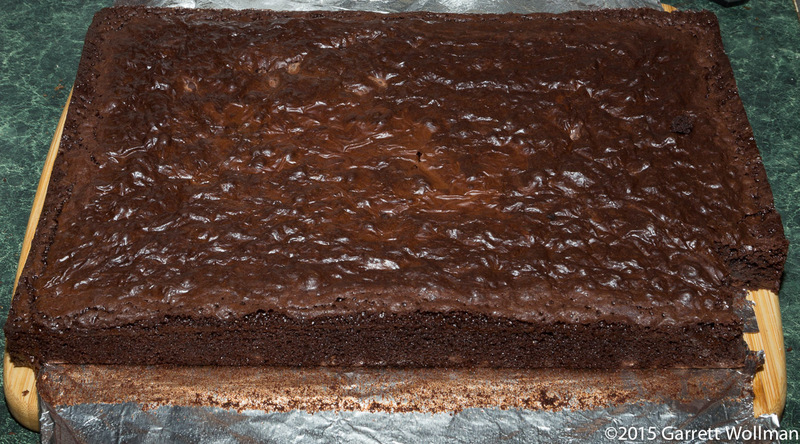 In this photo you can see a bit more of the internal texture — not completely fudgy, but moist and rich enough to satisfy nearly any chocolate-lover. One issue, however, is clearly apparent: the chocolate chips seem to have migrated all the way to the bottom of the batter during cooking. Next time, I may try a different assembly method to keep them more evenly distributed — perhaps mix three-fourths of the chips into the batter and reserving the remaining quarter to spread over the top. Having now eaten two of these brownies, I wouldn’t mind adding some nuts to this — probably walnuts, which would be my favorite, or maybe coconut. In that case, a smaller serving size would be indicated. Even without nuts, they’re still fabulous. 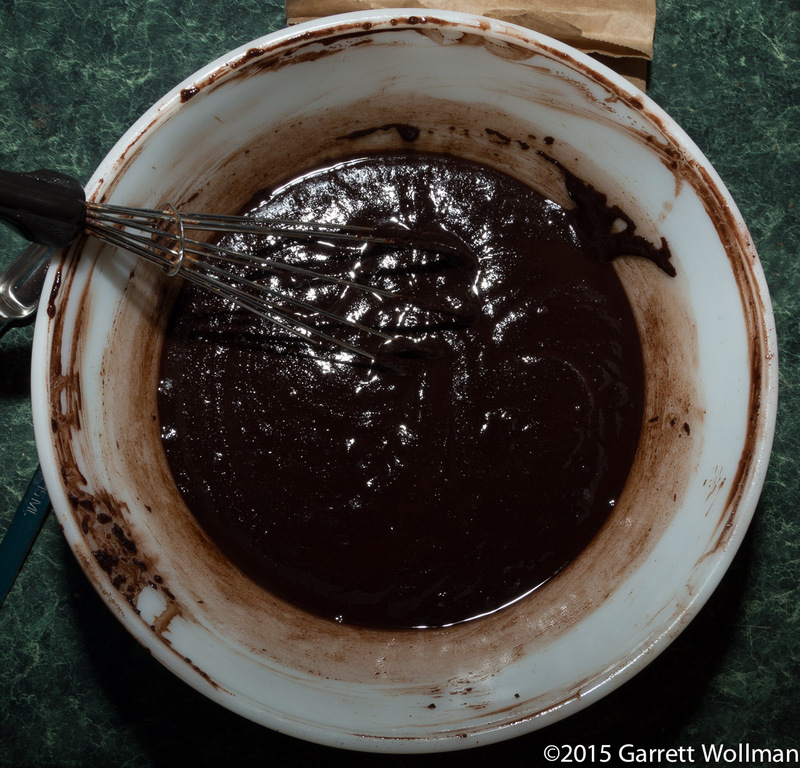 Gallery | This entry was posted in Food and tagged brownies, chocolate, King Arthur Flour, recipe. Bookmark the permalink.